Note: Facebook is the most important Social Media website that is always advancing and new features may be developed. We have integrated this 3rd party website on our platform and our team will continuously try to keep up with the latest improvements and updates. When sharing your content on Facebook, you may encounter some unexpected results. We will exemplify in this manual page some of these cases and possible error messages that are displayed on the player. If your channel is password protected and you share it on Facebook, the restriction will not be applied. 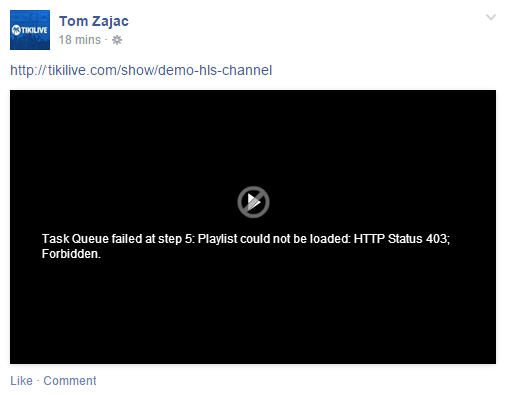 Facebook does not recognize the player restriction. People will be able to watch the channel feed without being asked to insert any access code. That is why recommend you not to share password protect channels n Facebook as the restriction will not apply.